Do Religious Differences Impact Timesharing? Deciding how to raise a child is an involved and personal decision for all parents, and inevitably, there will be times when parents disagree. Being able to compromise on childrearing is hard enough when a couple is together, but after divorce, finding common ground is even less likely. When it comes to timesharing, Florida favors awarding parents shared custody, which means both parents have decision-making authority and the right to see their child according to the terms of the time-sharing schedule. Two areas that are particularly prone to igniting disagreements between parents are education and religion. These two areas often form the child’s foundational view of life, and thus have a large impact on the person he/she becomes. Religion is especially contentious, but is not normally addressed in the context of divorce or the allocation of parental responsibility unless one or both parents specifically bring this matter to the court’s attention. Religion is a very personal issue that courts are loathe to invade, but depending on the circumstances, a judge may be willing, or even need, to broach this issue. Constitutional and state child custody laws both play into a parent’s right in this area. A discussion of the laws impacting a parent’s influence over his/her child’s religion, and private options for settling this issue between parents, will follow below. The U.S. Constitution generally protects a parent’s right to decide how to raise his/her child, which means parents are given fairly broad latitude to make decisions on a child’s behalf as long as no actual harm is caused. In addition, the First Amendment specifically supports the right of a parent to teach his/her faith to their children as an aspect of free speech. Thus, even in cases where a parent is awarded sole custody, a rare occurrence, and gains the right to choose which religion a child follows, the other parent is still very likely to receive some amount of visitation time. During the visitation time, the other parent has every right to discuss his/her religious views and/or take the child to participate in different religious traditions. 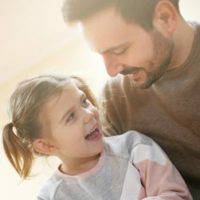 In practical terms, courts cannot stop a parent from introducing his/her child to the parent’s religious beliefs unless there is sufficient justification to bar contact between the parent and child, or the court specifically determines the exposure to the parent’s religion is against the best interests of the child. All child-related legal disputes are evaluated according to the best interests of the child by a court. Religious-based disputes are determined by striking a balance between the parent’s First Amendment rights and the best interests of the child. Essentially, the court will look at whether a parent’s belief system is likely to cause the child emotional, physical or psychological harm, which is a very fact-specific process. For older children, part of this evaluation could include asking the child his/her views on each parent’s religion, and how the child might envision participating in one or both religious systems. The court may not find that either parent has the exclusive right to guide the child’s religion, and enforcing such an exclusive right, if awarded, would be hindered by the other parent’s right to visitation. As a consequence, the most practical option may be to negotiate a parenting plan that includes detailed provisions that directly speak to this issue. Such agreements could include very specific provisions that govern how each parent refers to the other’s religious beliefs and/or restrict how one or both parents engages the child in religion generally. Detailed agreements could make navigating the highly stressful periods of holidays or family gatherings with clearly defined guidelines. An experienced family law attorney can help parents negotiate and draft parenting plans that address any issue of concern. Parents have a lot at stake in timesharing disputes, and need to put themselves in the best possible position to protect their interests and those of their children. Hiring a family law attorney will give you an advocate in the courtroom and during negotiations with the other side. Attorney Joyce A. Julian, P.A. has years of experience handling family law issues for clients in the Fort Lauderdale area, and is available to discuss your case. Contact the office for a free consultation.